Early in 2012 we asked WCET members and other notable thinkers to provide predictions for postsecondary e-learning for the year. From a OMG-it’s-all-over-the-media point-of-view, it’s quite clear that MOOCs were the big story this past year. None of our prognosticators nailed that prediction, but some got close to catching variations of what MOOCs were trying to accomplish. Starting a new tradition, we asked last year’s winner of the “Seeing the Future” award for top prediction of 2011 to review the 2012 predictions and to pick his successor. Last year’s winner, Myk Garn, did not predict that he would be moving from the Southern Regional Education Board to StraighterLine in 2012, but he made sure to take his crystal ball with him. While it seemed humorous at the time, the press and many academic leaders simply fell in love with the notion that MOOCs will soon be a revolutionary, game-changing, silver bullet that will solve higher education’s concerns about access, quality, and affordability. The attention really has put technology-mediated education into the spotlight. We better be ready for that in the coming year. 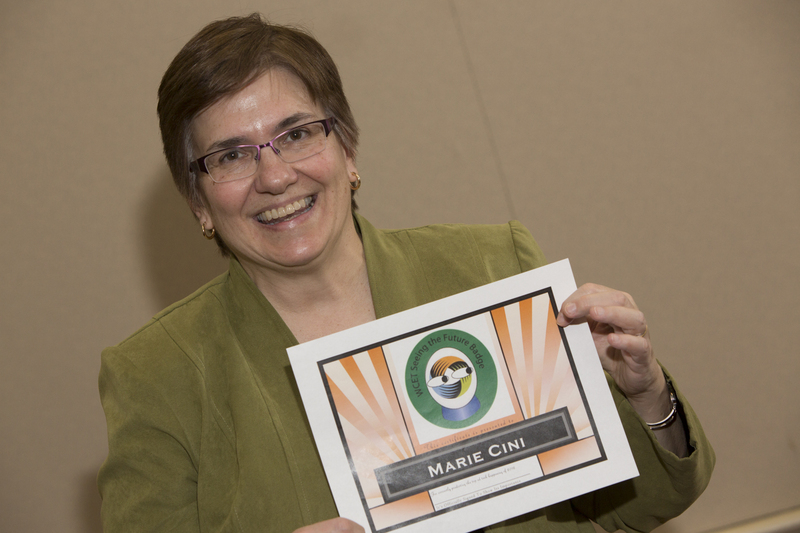 Marie Cini, UMUC, proudly displays her WCET “Seeing the Future” award. It continued to get buzz, media interest, and continued research…including WCET’s Predictive Analytics Reporting (PAR) Framework. The initial work is promising. However, there is still more work needed on wider acceptance. While there were some ripples in particular states, the federal and state landscape was relatively quiet. Federally, both a financial aid fraud rulemaking process and the future of a federal state authorization rule were put on hold. Reauthorization of the Higher Education Act is due to be considered in 2013, so talk may turn to action. At the end of 2012 and beginning of 2013, there were statewide meetings in Florida and California regarding to role of e-learning in the higher education quality, cost, and quality equation. Fran was prescient in that 2013 may see more state-level action on these issues. What seemed like a bold prediction actually may have been a bit conservative. Following on Governor Perry’s call for a $10,000 degree, Texas is figuring out how to meet that goal. Similar calls came from the governors of Florida and Wisconsin. The Bill & Melinda Gates Foundation funded the MyCollege Foundation, which partnered with a Catholic college to provide online associate’s degrees to disadvantaged youth. Going the opposite way and targeting the elite (who needed more help in pursuing higher education) is the Minerva Project. If we’re looking at MOOCs, this was the year of EdX, Udacity, Coursera, and others burst onto the scene. I know that we’re missing some, but it was a big year for grant and investment funds underwriting start-up activities. Certainly the much publicized work of the University of Wisconsin System, Northern Arizona University, and the University of Southern New Hampshire in creating competency-based alternatives caught our attention. Also, WGU Washington, joined its counterparts in Indiana and Texas as a competency-based alternative. You are invited to join in the fun for 2013. Predict something that will happen this year regarding teaching, learning, technology, business of e-learning, policy, regulations, student behavior, or other related items. You can submit your entry as a comment to this blog post or by sending an email to me at rpoulin@wiche.edu with the subject “2013 Prediction” by Thursday January 24. In 2013 budget-minded, fiscally-conservative students will offer significant resistance to loan debt. This will lead to a rise in discount educators – a Walmart version of higher education. Mid-level schools will feel the financial strain. A polarizing effect will stretch higher education between the discount schools and the top-tier, and top-dollar, schools. Both ends of the polarity will thrive but schools in the middle will begin to fail at an increasing rate. This will force more collaboration and innovation at the mid-level range leading to the adoption of novel business models and novel educational models. I predict that in 2013 students will begin to significantly resist taking out loans which will increase enrollment at budget-minded schools and cause mid-level schools to begin to fail. We will see the boom of a “Walmart” version of higher education for those who can’t afford to pay high tuition out of pocket and who decide not to take on significant debt. The education industry will begin to polarize along these lines. “The redefined traditional student – the part-time student, full-time worker, parent/caregiver – and the US economy will force many urban public institutions to consider HyFlex as a primary delivery mode. HyFlex will trend toward the norm.